"The First Skipper Born in Conway County, Arkansas"
Joseph Skipper had moved his family from North Carolina to Tennessee in about 1852 and then on to Arkansas in 1856, probably soon after Laura was born in Tennesse in early 1856. Conway County was a relatively new county and Springfield had just been established as a new town to serve as the county seat. Joseph bought about 80 acres in the area on the southeast side of Round Mountain which is located south of Lanty and west of Arthur. It was about a days travel northwest of Springfield. 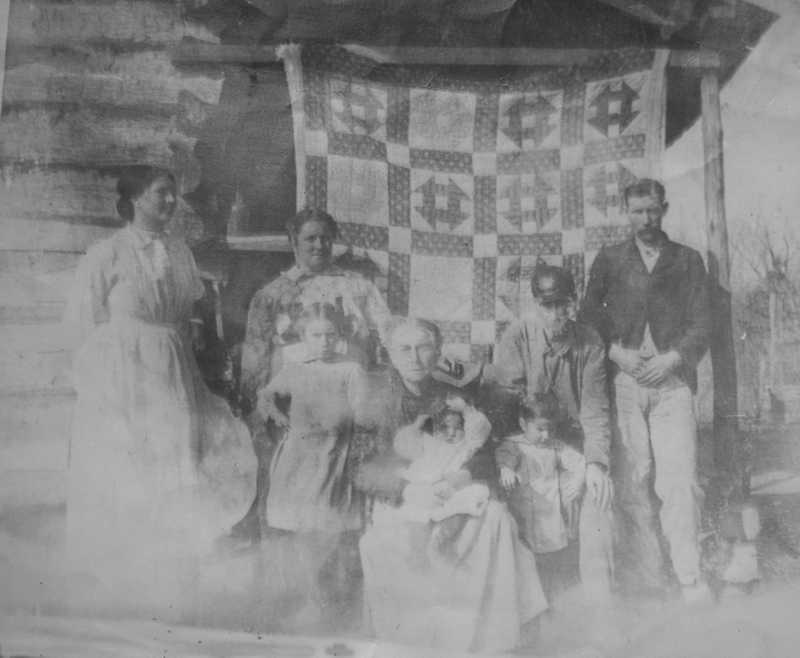 The Skippers had several sons when they left North Carolina and two daughters were born during their stay in Tennessee. Susan Louisa's mother Rebecca Gornto also came with them. By the 1860 Census of Washington Township in Conway County, the family consisted of Joseph, 47; (Susan) Louisa, 29; Charles, 18; James, 12; David, 10, and John, 8, all born in North Carolina. Caroline, 6; Laura, 4, born in Tennessee; Luezer (Louisa Jane), 3; and George, 1 month. Rebecca Garnto still lived with them. Joseph bought an additional 280 acres in 1860 and his sons, David and George added to the holdings in the area. Round Mountain became known as Skipper Mountain. The area is roughly half way between Lanty to the north and Arthur to the southeast and Solgohachia to the south. Life on the frontier in the 1860's was very primitive. None of the modern technological inovations that we take for granted now were available then. Even as some of these new inventions became available in other parts of the country, they were slow to make it to the remote parts of Arkansas. For example, electrical power was not available in tha area around Round Mountain and Lanty for about 80 years. The road between Solgohachia and the Lanty area was not paved for more than 100 years. The East Point Remove Creek crossing near the former Arthur settlement has been abandoned and the road from there northwest to the old McLaren settlement is a private farm lane. People on the frontier were mostly limited to what they could provide for themselves from their land. Some trade was necessary for things that couldn't be grown or produced on a farm such as iron impliments, sugar, salt, and kerosene. Many families managed to produce their own wool for homemade clothing and leather for shoes. This was the way of life that Louisa Jane grew up in although she lived to see a few of the marvels of modern technology. Travel in those days was limited to foot, horse back, ox cart, or wagon although steam boats were able to make their way up the Arkansas and White Rivers. When Conway County was formed by the Arkansas Territorial Legislature in 1825, they decreed that the temporary county seat would be Cadron on Cadron Creek. Later Cadron almost became the Arkansas State Capitol in the competition with Little Rock. By 1831 the county had managed to decide on Lewisburg as the permanent county seat. Lewisburg was a major town at the mouth of the Point Remove Creek on the Arkansas River that developed when Mr. Lewis moved there around 1825. The Arkansas River ferry crossing was at Lewisburg for almost a hundred years and it was the port for riverboats. Development in the Lewisburg area moved inland to the site of Morrilton and Lewisburg was eventually abandoned. Morrilton developed and became the county seat. The Skippers lived about 15 miles from the river so they surely didn't make the trip often. The women probably didn't make the trip more than once or twice a year. The arrival of a steamboat would have been a major event in small country towns along the rivers back in those days. One of the modern conveniences of that time was the kerosene lamp. It is said that kerosene saved the whales because it began to replace whale oil as the major source of lighting fuel at that time. The bears in the cane breaks along the White River in northeast Arkansas provided another source of fuel. It was rendered in troughs and stored in tree-trunk barrels over on the banks of White River at the town that became Oil Trough. Many country folk didn't even have kerosene lamps and used them rarely if they did. They got up when it was light enough to work and went to bed when it got too dark. The fireplace provided a source of light as well as a place to cook food and heat water from the spring. Louisa Jane's father, Jospeh, could read and write, but her mother, Susan Louisa, could not and Jospeh probably didn't read enough to really need any light. Even matches were few; fires had to be maintained by keeping the coals going. Perhaps little sticks of wood were ignited in the fireplace to light the lamps are start fires in other locations. Louisa Jane was only six when the Civil War started. A little brother, George W., had been born about June of 1860. He was one month old when the 1860 Census was taken. Mary was born in 1863 about the time Joseph joined the war. Joseph joined the Union Army when Little Rock was captured. He was 50 years old and soon became ill and was sent to St. Louis for treatment. Dunkin (or Duncan) was born in 1866 after Joseph got back home and twins Wilson and Mavan were born in 1867. They were the final children of Joseph and Louisa. J. W. (Joseph), 55, farmer; Susan (Susan Louisa), 40, housekeeper; (older sons James and David had started families); John, 19; Caroline, 17; (Laura, who was born in TN, is not listed. At 14, she would have been a little young to have married so perhaps she had died); Jane, 14 (probably "Luezer" or Louisa since listed as born in AR); George, 10; Mary, 7; Dunkin, 4; and Wilson and Mavan, age 3, who were probably twins. Rebecca Garnto, 65, is "boarding." Jane or Louisa Jane would have only been 13 when the census was taken, but she would have been 14 on her birthday in December 1870. Census data is not always accurate. A little judgement and guess work is required. Louisa Jane was 15 in December 1871 and that was about the time she married David Lawson Rentfro. David was 35 years old and had been married before. He had married Hulda Whitehead in 1857 and they had two children. When Hulda died in 1868 at the age of about 30, the children were sent to live with Hulda's brother, Jim Whitehead, and brother-in-law, Jim George. The oldest child, John William Rentfro, was the grandfather of Raymond Rentfro, who married Jeanne Fran Skipper, a distant relative of Louisa Jane 'Deed' Skipper. John was 9 when his mother died and his sister, Nancy, was a little younger. Louisa (Deed) Jane's first child, Louisa Ellen Rentfro was born October 9, 1872, when Deed was 15 years and 10 months old. They used her middle name 'Ellen' to distinguish her from her mother, but she is listed as Louisa E. on the census. One of her descendents said that her first name was Frances, not Louisa. Soon after Louisa Ellen was born to David and Deed, David decided to go to Texas to see if things were better there where his brothers lived. He mailed a letter from Mena, Arkansas, to one of his brothers and then he was never heard from again. Deed and her little daughter, Ellen, moved in with Deed's parents, Joseph W. and Susan Louisa Skipper. This was a difficult time for Arkansas and the other southern states. Bushwhackers and other lawless men roomed the countryside. Transportation was primitive. Railroads had not been built as far as Conway County and points west and there were no improved roads. Those who couldn't travel the major rivers to their destinations by boat were required to make their way cross country by horse or foot. The brothers in Texas never reported that David had arrived there and he was assumed lost to accident or murder. Weapons were important for country people in those days. Wild game and half-wild hogs were a major source of food and rifles were necessary to kill them. During the Civil War era, the modern cartridge rifles and shotguns were developed and these gradually came into use as men were able to buy them to replace their old flint-lock or cap and ball rifles. The colt revolver and other hand guns were becoming more common although they were not so common on the farms. Louisa Jane 'Deed' Rentfro married William A. Dixon and they had a daughter named Rebecca in 1876. Louisa Jane's Grandmother Rebecca Gornto was still living when Louisa's daughter Rebecca was born. The Iron Mountain Railroad was building a railroad west through Conway County and in 1876 it reached Morrilton which was the county seat of Conway County by that time. Riverboat traffic on the Arkansas River was gradually replaced by the train. There was still a ferry across the river at Lewisburg, but many people preferred to go on up the north side of the river another 25 miles to take the ferry at Dardanelle. The 1880 Census of Washington Township in Conway County Arkansas shows that W. A. Dixon, age 27, worked on the farm and his wife, Louisa, was 23. The wife's daughter, Ellen Renfroe, was eight years old. Their daughter, Rebecca, was four. Bicycles were the big thing in personal transportation in the 1880's, but roads in Arkansas were so poor and the people were so poor that few had bicycles. Even Morrilton had few, if any, paved streets. The 1890 Census records were destroyed in a fire. William and Louisa Jane were still living in Conway County. He was 37 and she was 34 on her birthday. That is considered young today, but in those difficult times, people aged fast. Louisa Ellen Rentfroe was 18 years old and Rebecca Dixon was 14. Louisa Jane's father had died in about 1887, but her mother, Susan Louisa, was still living. Her Grandmother Rebecca Gornto probably died in the late 1880s. Three of her brothers lived in the area and were doing well. Books of stories about Conway County citizens from about 1890 tell about some of the Skippers and refer to Louisa Gornto Skipper as the mother of George and John, but don't mention Rebecca. Susan Louisa Skipper was said to have had four living children in the 1900 Census. Since John W. Skipper had died by that time, another sister, perhaps Caroline, was still living, but there is no record of her in the 1990 census for Arkansas. Louisa Jane and William had a son, Hugh Dixon, in December 1892 when Louisa was 36 and another son, James D. Dixon, in January 1897 when Louisa was 40. In March of 1896, at the age of 24, Louisa Ellen had a daughter whom she named Gertrude. We will search for a wedding record, but by 1900 she was living with her parents and was listed as a Renfro in the census. Gertrude was probably Louisa Jane's first grandchild. Louisa 'Deed's' second daughter, Rebecca, is not listed with the family in the 1990 census. Rebecca would have been 24 years old and was probably married by 1900. Ellen had another daughter in April of 1898. The census record isn't clear but the name seems to start with and 'E' and end with a 'y.' It might have been 'Ebony.' In any event she isn't listed in the 1910 Census when she would have been 12 years old. The 1900 Census lists William A. Dixon's birth as February 1852 and his age as 48. He and Louisa (Deed) had been married for 26 years. Louisa's birth was listed as December 1856 and her age as 43. She had had five children and four were still living. Sons Hugh and James Dixon were seven and three. A nephew, Hubbard Dixon, lived with them. Also in the household was Louisa E. Renfro, step daughter of William Dixon. With Ellen were listed Gertrude and Esony? daughters aged four and two. The census seems to indicate that 'Renfro' was the surname of the two little girls. The state of technology in central Arkansas at the end of the ninteenth century was still primitive by todays standards. Morrilton probably had local telephone service, electrical power, and a public water system. This was of no benefit to folks out in the country though. Morrilton may have had an ice plant by that time and people would sometimes pick up ice on their trips to town. Roads were not paved and to get to the Round Mountain area and Lanty the East Branch of Point Creek had to be crossed at a ford north of Solgohachia. This was hard to do with a team and wagon when the water was up and the people living near the creek would advise travelers about safe water levels. One new transportation aid was the 'iron' bridge on the road west from Sprinfield to Dover. It was was built in 1890 and is still in use more than 100 years later. There may have been a bridge across East Point Remove Creek on Highway 95, but the ford on the road between Solgohachia and Lanty was in use by mail carriers as late as 1910 and perhaps 1920. None of the highways were paved. Highway 95 was paved in the mid-1950's and the road from Solgohachia was paved some time around 1980. However, a bridge had been installed across East Point Remove before 1950. There were no automobiles or any gasoline powered devices in 1900. Everything was done with human or animal power. Although there was some steam powered farm equipment back then, those poor hill country farmers couldn't afford it. Things that we consider very important now were not available then. Simple personal items like toilet paper and other sanitary paper products had not been invented. Toothbrushes were rare and there was no toothpaste. People chewed the end of a twig to fray the end and then used that to brush their teeth. There were no aluminum or plastic products. The new material of the age was rubber and it was being used to make more and more helpful thinks like rain coats and boots for those who could afford them. By 1910, William Dixon would have been 58, married 36 years. Louisa Jane 'Deed' would have been 54, Hugh would have been 17 and James would have been 13. Louisa Ellen would have been 37, Gertrude would have been 14 and Esony would have been 12. William Dixon - 53 married for 33 years. Louisa, 52, having 5 children, 4 still living. Sam H. 17 and Drewby J. 13. Some discrepancy there. Louisa Jane's mother, Susan Louisa Gornto Skipper, had died by 1910 and so had Louisa Jane's brother, David James Skipper, who was my great grandfather. The other brother, John W. Skipper was still living. His wife had died and he was living with his brother George's widow. There were many nieces and nephews still in Conway County in 1910. Apparently Ellen married Charles Dixon after 1900 and they had Wilma G. in 1906. Their son, Hughie T. Dixon was born in 1911 or 1912 and Charles died before 1920. I would guess that Deed was the center of the family. Her name was spoken of for more than thirty years after her death. This photo was taken in 1911 or 1912 soon after the birth of Hughie to Chester and Ellen Dixon. Ellen had had several children before she met Chester. Chester is on the far right. William Dixon, Chester's uncle and Deed's husband, is holding little William who had been adopted by Ellen and Chester. Deed, 53, is holding Hughie. Ellen, 40, is behind Wilma, who was six. Gertrude was 16. Ellen was the daughter of Deed and David Rentfroe. Gretrude was one of Ellen's early children. Photo provided by Lucille Robards, great grandaughter of Deed. Lucille's father was little Hughie in this photo. The 1920 Census lists Ellen as a widowed head of household at age 47 living with daughter Wilma G. age 14 and son Hughie T. age 8 in Gregory Township of Conway County. Ellen died in 1929 at the age of about 57. Ellen's daughter, Wilma, married a Childress. Ellen's son, Hughie, had a small county store north of Atkins, Arkansas, until late in the 20th century. Hughie's children were Thelbert, William, and Lucille. Louisa Jane may have died between 1920 and 1930. She would have been 64 in 1920 and few lived to that age back then. But let's do a little further research.